Besides Jupiter lighting up the night sky, one of the bright spots about winter is that it’s citrus season. A juicy orange or grapefruit makes up for a gray winter landscape. Lemons, limes, and tangerines are members of this all-star family that help maintain a strong immune system and protect against heart disease and cancer. You probably know that oranges are terrific source of vitamin C. So are it’s cousins. Did you know that the word “ascorbic,” as in ascorbic acid — the name for vitamin C — means “no scurvy”? While scurvy was a problem for sea goers centuries ago, it’s not much of a problem today. However, many Americans do fall short on iron. The vitamin C in citrus fruit enhances the absorption of iron in food. Vitamin C binds to iron in the digestive tract and the iron-vitamin C team is absorbed together. We eat what we see and fruit disappears from a fruit bowl about twice as fast as the fruit in the fridge. 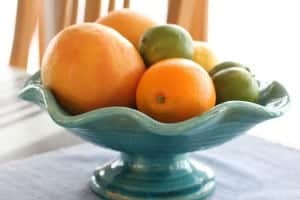 So set out a fruit bowl to enjoy the beautiful colors, fresh aroma and juicy freshness. One orange provides 100 percent of the daily recommendation of vitamin C. And since vitamin C must be replenished in our bodies every day, treat yourself to oranges, tangerines, and grapefruit to meet your needs. When you shop, look for fruit that are firm and heavy for their size, with bright, colorful skins. Avoid fruit with bruised, wrinkled or discolored skins; this indicates the fruit is old or has been stored incorrectly. Most citrus will keep at room temperature for several days. 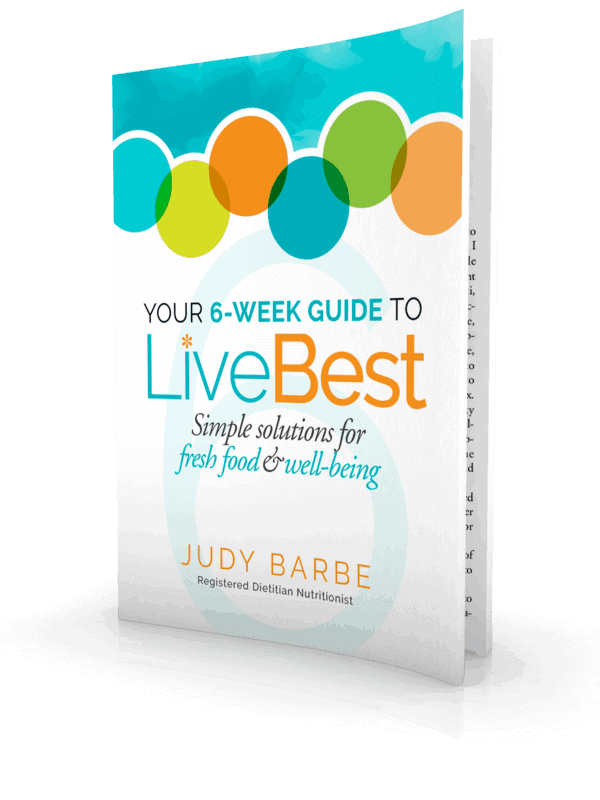 For best results, store citrus in the crisper drawer of your refrigerator. Whole citrus fruit should not be frozen, but the fresh-squeezed juice and grated peel or zest may be. Seal some in a plastic bag and pop it into the freezer for next time. TIP: If you’re squeezing for juice, roll room temperature fruit on the counter a few times to maximize the amount of juice. 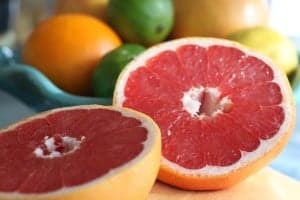 Add sliced avocado and grapefruit sections to salads. 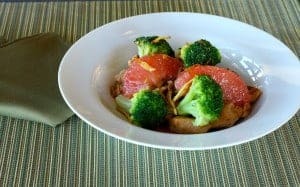 Broil a grapefruit half for breakfast or as a dessert. Toss fresh orange slices with shredded red cabbage, a little rice wine vinegar and toasted sesame oil. Squeeze a wedge of fresh lemon on salads, steamed vegetables, soups and stews. Stand over the sink and eat a fresh juicy orange! Zesty grapefruit and ginger make chicken and broccoli a party in your mouth. Even better, these foods deliver top-notch nutrition. Rich in healthful compounds, broccoli is a super star for disease prevention. But those compounds quickly disappear upon harvest. Choose the freshest you can find and look for dark green color with tightly closed buds and moist, smooth, stems. Fresh ginger is one my favorite spices. I love the spicy aroma and flavor it adds to dishes. With ginger I usually have a heavy hand,using more than a recipe calls for. It’s used as a remedy for nausea, but this herb is also may reduce inflammation. Find fresh ginger in the produce department. Choose ginger that is heavy for its size, with smooth skin. Avoid the wrinkled, shriveled pieces. Store ginger in the refrigerator, wrapped in a paper towel and in a zip-top bag. It can also be frozen for up to 6 months. 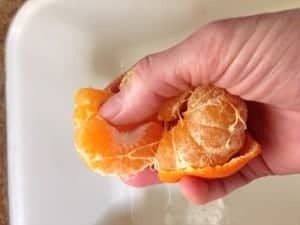 To use, peel the skin with a vegetable peeler. Enough talking, let’s get to cooking something relish and nutrish! In 10-inch skillet, heat oil over medium heat. Cook ginger, stirring occasionally until golden brown, 2-3 minutes. With slotted spoon, remove ginger, set aside. Increase heat to medium-high and add chicken. Stir constantly, cooking until no longer pink. Remove chicken and set aside. Add broccoli with 1/4 cup water. Cook until tender crisp. Return chicken to skillet, add broth, grapefruit juice, and soy sauce. Add cornstarch mixture to skillet. Cook, stirring frequently until mixture boils and thickens slightly. Add grapefruit sections and ginger and heat through. Serve.